The Survey Department of Sri Lanka serves as the National Agency for Survey and Mapping, and holds this particular responsibility to the Nation. The department was established in the present form in the year 1800.The continuous existence for 218 years for any public organization is a matter that can be recorded with pride. The Survey Department has played a leading role in most of the development activities in Sri Lanka. 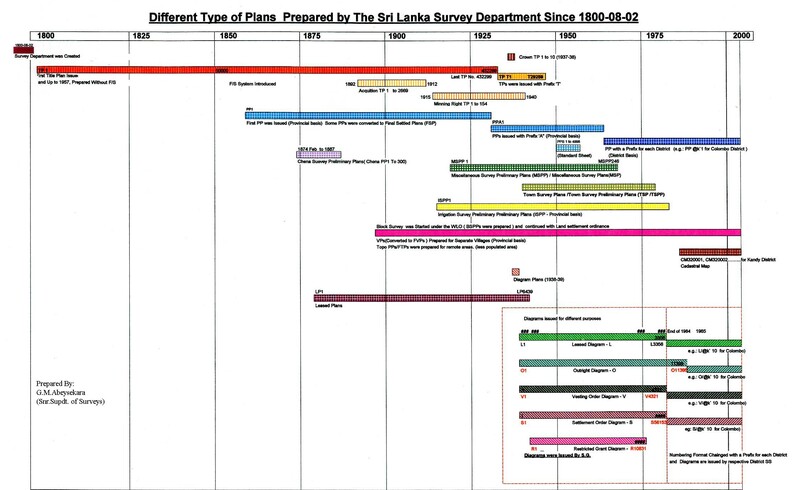 Few of the major contributions are; Surveys for Land Settlement, Land Development, Land Reform, Mahaweli Development Project, Galoya Irrigation Project, Southern Highway Project, Central Highway, Southern Habour development project, Southern Airport establishment project, Power generation projects, establishment of Geodetic Control Network and upgrading same to a higher level of accuracy with the introduction of Global Positioning System (GPS), publishing the National Atlas in all three languages (Sinhala, Tamil and English), One inch to One Mile Map Series for the entire country, which was subsequently replaced by 1 : 50,000 Topographic Map Series, 1 : 10,000 Topographical Map Series for 80% of the country, 1 : 2,000 City Maps of Colombo and suburbs, and establishment of Topographic Vector Databases at the scales of 1 : 250,000, 1 : 50,000 and 1 : 10,000. One of the major tasks undertaken after 2004 Tsunami in Sri Lanka was mapping the affected coastal areas to enable efficient and effective decision making in relief and rehabilitation measures. Major on-going activities of the Department under new developing concepts of the Government are; carrying out surveys to map and database each and every piece of land in the country to issue owners with a clear title under ‘Bim Saviya’ programme, contributing to Northern Highway Project, Acquisition and resettlement surveys to resettle the displaced citizens in the North-East region of the country. Further, the Survey Department is enriched with the latest technology in the field of Geo-information handling and management. It is all the time engaged in research for exploring science and technology to cope up with dramatic change of new technology that opens the gate for the improvement of the country’s development for the wellbeing of the nation. Survey Department is guiding its employees to perform their services for the development of the country with honesty and dedication, upholding the noble traditions of the profession. I am privileged to convey this message as the 48th Surveyor General of the Survey Department of Sri Lanka. A workshop regarding of a proposed project which is performed jointly by all the Municipal councils in the island, and the Survey Department, based on “Preparation of Land data infrastructure and Land Information Service System under Korean aids was held on 15.02.2019 at the auditorium of Surveyor General Office. Objectives of this proposed project is preparation of tools which appropriate to make the services currently provided to the general public by the Municipal Councils efficient and improving of infrastructure facilities required. © 2014 Survey Department of Sri Lanka. All Rights Reserved.